Mallorca Clinic, BEST Fest & Our Tips On Tapering Effectively ~ Feel For The Water! Advice & Tips to Improve Your Swimming. Today we're opening up places for a special Swim Smooth 1 Day Stroke Correction Clinic on 27th May at the BEST Centre, Mallorca. This is a very rare opportunity to have your stroke analysed and corrected by our Head Coach Paul Newsome who is over from Australia! The course has just 10 places and will fill up very quickly indeed, so don't miss out. We'll also have 20 (yes 20!) additional coaches attending the course (2 assigned to each swimmer), looking after you and giving additional tips during the day. An unmissable opportunity in a unique location! And of course the Swim Smooth team are going to be staying on after the clinic for The BEST Fest open water festival which runs from May 28th to June 3rd. Thanks for all your responses to our post last week on how to lay out your races through a season. We know from your replies and shares that you're really keen to hear some more of our thoughts on how to taper, especially for distance events such as open water races and triathlon. 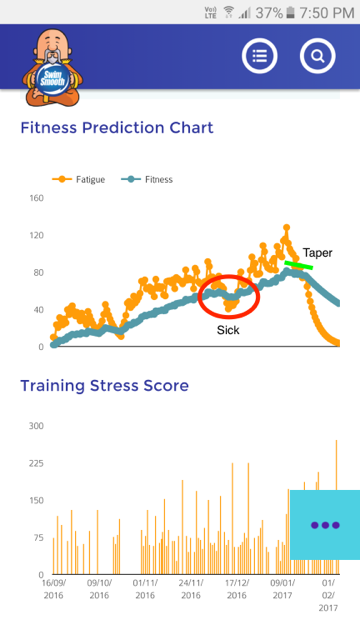 Tapering is where you reduce your training in the build up to races to remove fatigue from your system and give your best performance on race day. If you rest up too much ("over tapering") then you will be well rested but feel sluggish on race day as your body has started to switch off from exercise. Further to that, if you performed a really long taper you might start to lose some fitness from the lack of training too. Alternatively, rest too little ("under-tapering") and you'll carry fatigue into the event and under perform as a result. You might even find you motivation is low and you're not in the mood for the race. Getting the balance right depends quite a lot on you as an individual, the training you've been doing and the distance and demands of your race. Everyone responds to training in slightly different ways and recovers at different rates. Some athletes need to taper a lot to remove the fatigue from their system whilst others recover quickly and require less of a taper. So to some extent the best taper for you needs to be personalised to you as an individual. Experienced elite athletes have refined their tapers over many years of experience and often ending up at a very different place from when they were a junior athletes - a classic example of "If only I knew then what I know now!". Because of this need to tailor things to you individually, treat the advice and example taper below as a "middle of the road" option and over months and years, gradually adapt and refine your taper to suit your needs - just like the pros. Generally speaking the younger and more talented you are, the quicker you recover from training and the shorter the taper you need. - You only need to taper at all if you are training hard enough to create some residual fatigue on race day. If you are only swimming twice per week (as many triathletes do) then you probably don't need to taper at all. Train normally, but don't swim full sessions in the two days before the race. - For swimming, tapers are normally between 5 and 14 days in length. 6-7 days is a sufficient taper for the vast majority of swimmers training for swims of 5km and below (including triathletes). Tapers of 10-14 days in length are normally only necessary for those doing big mileage for marathon swims. - A good way to freshen up while keeping your body "switched on" is to swim on your normal days but aim for around half your normal distance in every session. Reduce the distance you swim at higher intensities to around one third to one half normal distance but resist the temptation to go faster - keep the pace the same despite the shorter distance. - Aim to get out of the pool at the end of every taper swim feeling like you've got plenty left in the tank. - Use race week to dial in your race pace for the event. Many a good race is destroyed by starting too fast - use a Tempo Trainer Pro to calibrate your judgement of race pace during the taper. - Swim the day before the race and treat it as a loosener - don't stress yourself at any stage. Swim a few drills and a few short efforts at race pace with lots of recovery. This session might be 800-1200m in length (or perhaps a little more if you are very fit). Aim to feel good but don't worry if you don't - often you can feel a bit average the day before a big race but feel awesome when race-day adrenaline kicks in. - Find a quiet spot, clear your mind and practise a little positive visualisation in race week. Think about different scenarios that might happen (good and bad) and how you will react to them. For instance, imagine you lose sight of the buoys and start to feel disorientated - you visualise calming yourself down and sighting with good technique until you pick up the route again. Always visualise recovering and succeeding! But what should things look like in practise? As a guide, here's an example for a swimmer training for a 5km open water swim. She trains 4x a week, totalling around 12km a week. Monday: CSS session. Total session distance: 3000m. Tuesday: Technique session. Total session distance: 2700m. Thursday: Red Mist or Aerobic Endurance Session. Total session distance: 4-5000m. Saturday: Open Water skills in the pool or open water. Total distance distance: 2400m. Monday: Mini CSS set of half normal distance (900m vs. usual 1800m set length) maintaining normal CSS pace even though she could go faster through a shorter set. Total session distance: 2000m. Tuesday: General technique swim but nice easy pace throughout and only two thirds normal distance. Total session distance: 2000m. Thursday: Steady 1500m swim including a few key drills for her stroke. If in the pool include 2x 300m swims at 5km pace using a Tempo Trainer Pro to "dial in" race pace. If at the race venue this could be on the course to become familiar with the surroundings and work out sight lines to buoys / turns. Saturday: 1000m easy paced loosener including 4x150m at 5km pace (no faster) with lots of recovery between each. In the pool or if possible in the open water at the race venue (again use for course familiarisation / sight lines). Note our example swimmer is training on her normal days of the week. This is fine if you can do it but if necessary switch your days around to avoid swimming a full session in the last few days before the race. As you train you are obviously looking to get fitter and you can see your progress on the chart as the weeks and months go by. 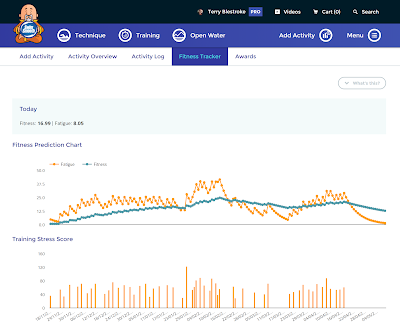 But you can also monitor your fatigue levels too, so if you have a bad session you can see if that's just because you are tired and you need to take a few easy days to recover. Apart from some sickness and missed training in December, Karlee had a great preparation with the blue fitness line heading ever upwards through her preparation. Notice also how the fatigue levels (orange line) build too as she's putting in those big sessions. Then we can see her taper down in the last 2 weeks - notice the fatigue levels dropping from around 130 to a much lower 75, a level she knows she can perform very well at. As a result Karlee smoked the swim and finished a stunning 11th female overall in an international field. Brilliant swimming! This Fitness Chart is a great way of visualising everything we've been talked about in this post. Not only can you look in detail at any individual taper but you can also compare tapers event to event, learning where you did too much or too little and how that affected your performance.